Stripes is for sure my absolute favorite print/pattern. This Spring, I noticed I rarely wore stripes. Not on purpose at all. I looked into my closet, and saw this striped sweater tucked away. It was meshed between two chunky sweaters. I bought this sweater during the holidays as my Winter brights and last featured it here with my best friend. 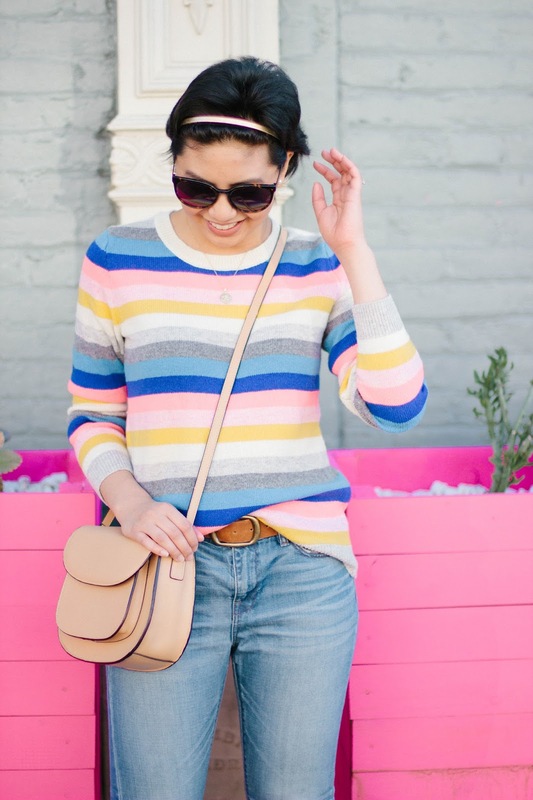 However, the striped sweater transformed from Winter brights to Spring stripes. The different hues of blue, pink, and yellow created spring colors due to its pastel-like colors. I knew this was my way of incorporating stripes to my Spring wardrobe. I decided to wear this outfit during our trip to Oakland and it was perfect for the trip. I honestly think it was perfect because Oakland has spots of pastel and light color backdrops haha. I wanted to keep the outfit laidback so I grabbed my boyfriend jeans. 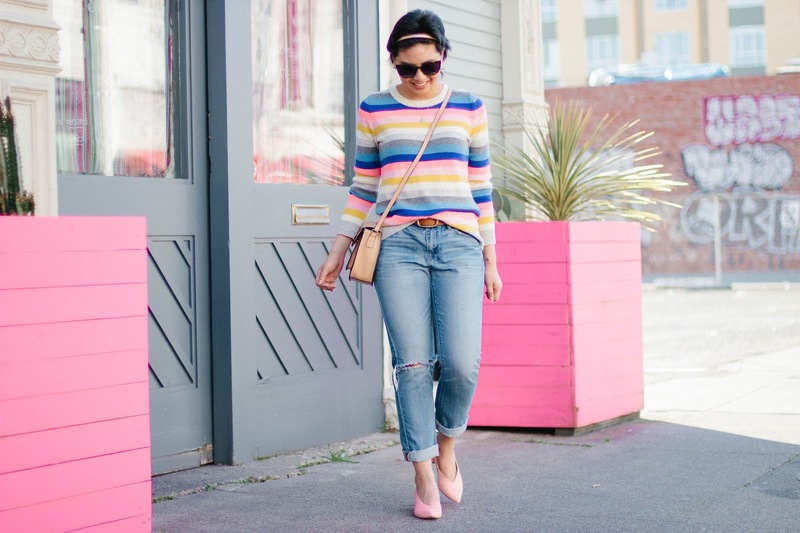 I just love the relaxed look and feel of the boyfriend jeans. I paired it with my favorited block heels. These heels are for sure one of my favorite purchases from this season. I love it’s blush color and the kitty heel height is perfect. The height is just enough to make my legs appear elongated but short enough so it is comfortable to walk around in. Without a doubt, it has been worn on repeat multiple times. 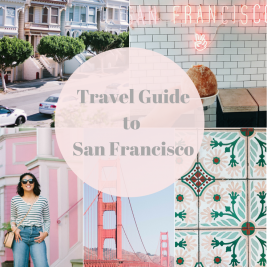 Stay tuned, I will be sharing my Oakland Travel Guide! This sweater is cute! 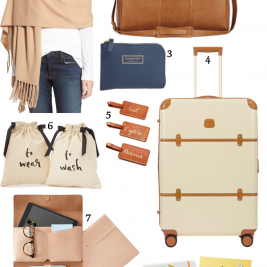 I love the color palette for spring. Hope you had fun in Oakland! Thanks Julia! It was fun! I love that jumper a lot! Such a cute outfit! Loving the stripes on you! 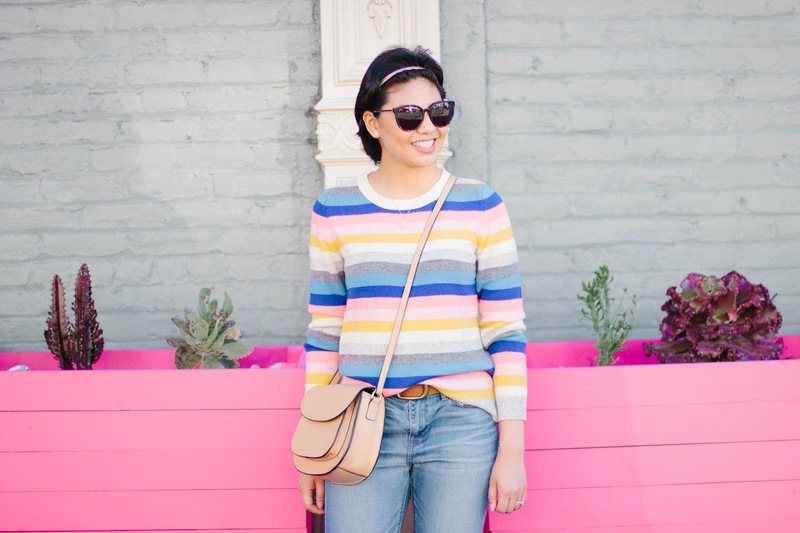 The sweater is the cutest colors – so fun for spring! Loving the spring stripes, mahal! 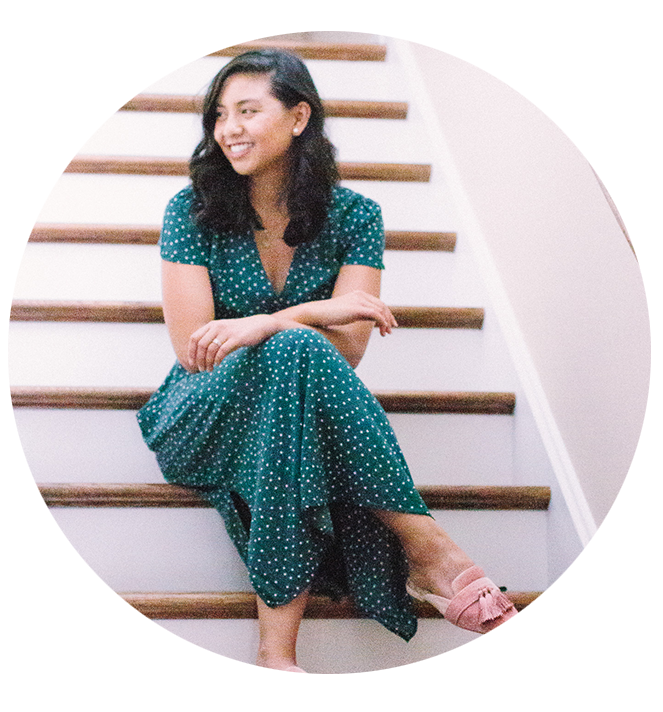 What a cute look and I just love the location you shot in! It goes perfectly with this look! Okay obsessed with this look!! The jeans, shoes everything is perfection! Love that stripe sweater!! Perfect for spring with the array of colors!! I love that colorful sweater! Such a cute background, too. I live in the Bay Area, so I really need to go take photos at this lovely blue and pink setting in Oakland. Where is it? I am loving your striped sweater and your shoes. You are way too adorable! I promise, I will get back to you on the address! 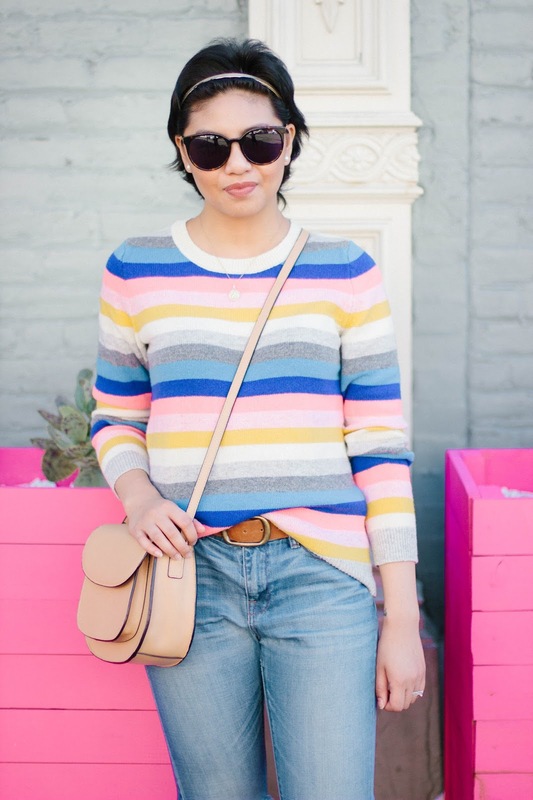 Love the sweater with stripes print! perfect spring look! How pretty is this sweater?! I just love the colors in those stripes! 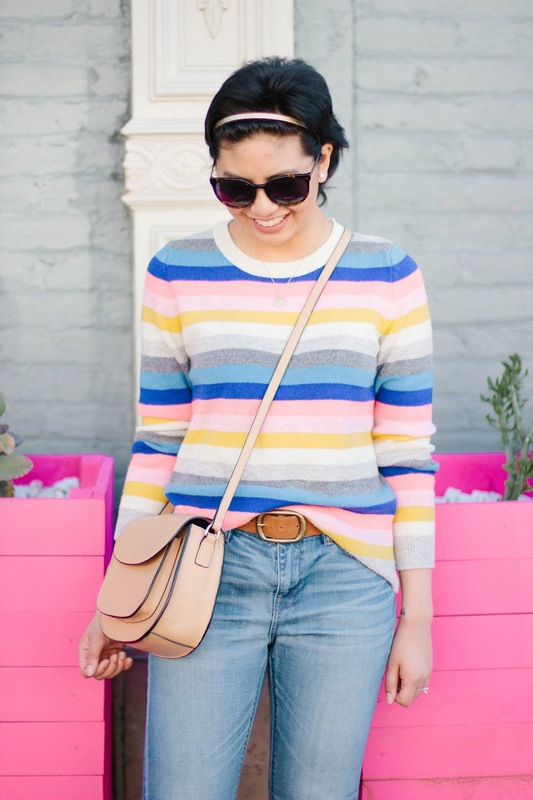 That multicolor striped shirt is just such a fun color palette! Such a pretty style Rach. Totally adore it. Love at first site with these pastel stripes. I need this whole look and that price is so good. I really need to start shopping at JCrew we have one in the mall I live close too and I never go in. That has to change though. Girl, definitely go! It will be an addiction! This color combo is sincerely the BEST!! You look so cute and what a perfect pink back drop!! These pictures scream SPRING has arrived!! That sweater is so cute and I love color combo! 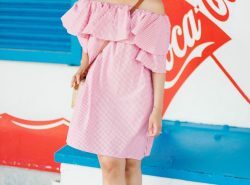 This is a great outfit for spring! 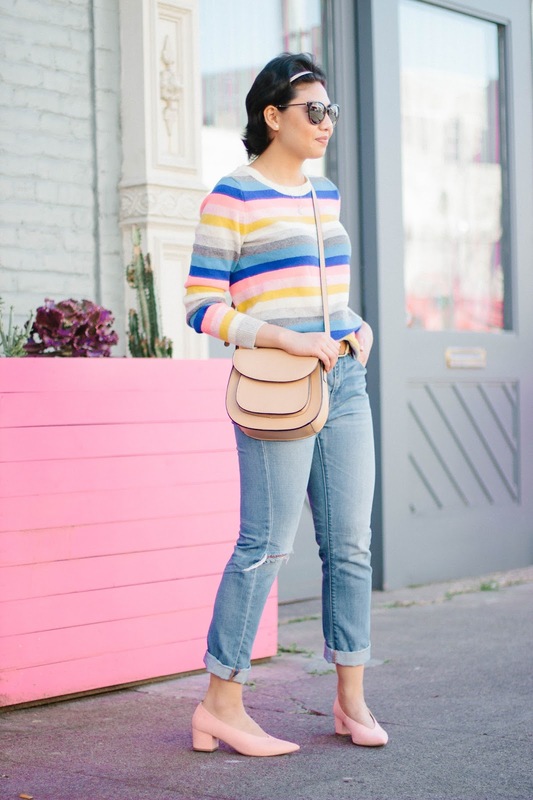 That is the perfect sweater for Spring and those shoes match perfectly and are so beautiful, Rachel. Looking forward to your travel posts. 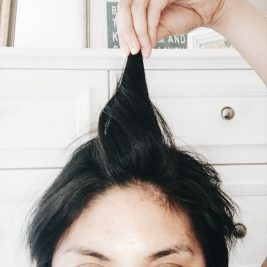 I host a linkup on Thursdays, so come linkup with me. The new is live below, linked =) Thank you! That is for sure a jumper that works for winter as good as for spring. And the shoes ho very well with the outfit, great thing they are comfortable as well. Como me gustan los jerseys de colores y sobre todo para la primavera. 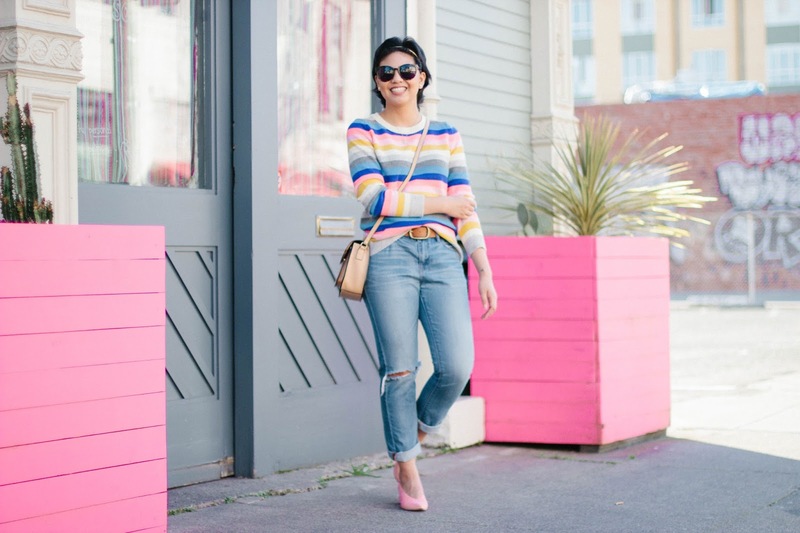 The perfect spring sweater! 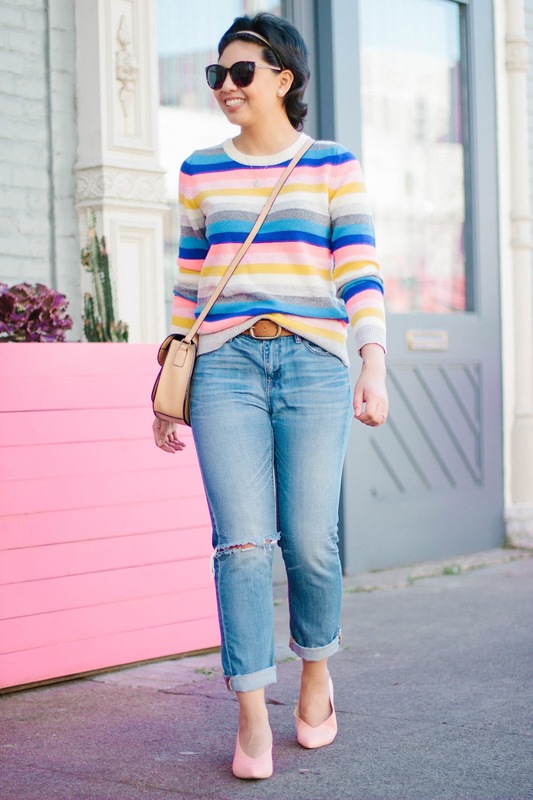 Loving the pops of color and such a great outfit for this crazy spring weather! I love these stripes SO much! And what darling shoes to wear alongside this look! Darling head to toe!! Isn't stripes the best?! Thanks Christina! What fun stripes – you look great! Spring is all about color! Love the top!